If you're interested in Thom's future workshops, be sure to check out the new menu item in the gray bar above. At least amongst the serious enthusiast market, there seems to be this growing groundswell of "I'll be shooting full frame some day." Read the full article on dslrbodies.com. It seems I have a few photos supplied to me that didn't make it into the daily blog postings or came to me after I'd already posted a day, so I'm going to put those here with a bit of commentary. Read the full article on bythom.com. The Stylus name returns, but it comes looking like a small DSLR. Read the full article on gearophile.com. Oct 29 Day 13 — Livingston Falls, I Presume? We're nearing the end. Today we break camp one final time and make the multi-vehicle move to Livingston, Zambia, where Victoria Falls happens to be. Read the full article on bythom.com. For a camera company to grow in the future, it must acknowledge the world in which we now live. Virtually none do, though a few now provide awkward ways of getting by. Read the full article on gearophile.com. At last week's Photo Plus Expo in New York, Sakar was there…[but] what do they mean by m4/3? Read the full article on sansmirror.com. One of the great things to do in Chobe is to get on a boat and head up the river. Read the full article on bythom.com. DxO Optics 9.0 has a new noise reduction engine built into the demosaicing called PRIME (Probabilistic Raw Image Enhancement), which analyzes up to 1000 neighboring pixels to try to determine what's fine detail and what's noise. Read the full article on dslrbodies.com. Water is life in the wild. So where there's lots of permanent water, there's lots of wildlife. Read the full article on bythom.com. It's move time again, with today's goal of seeing a few remaining things we've kept in our back pocket for the morning, then a longish but mostly pleasant drive up to Chobe, our last tent camp for this trip. Read the full article on bythom.com. Sitting through Apple's big product roll-out yesterday I had a lot of thoughts beyond what Apple was announcing. One thought was "two industries as I knew them are now marginalized and dying." Read the full article on gearophile.com. Read the full article on dslrbodies.com. I can always tell something is brewing in Europe when my In Box is filled with pointers first thing when I wake up in the morning. Read the full article on bythom.com. I've been holding out on you. Way back in Moremi each evening I tended to introduce a new aspect of shooting at night to the students. Read the full article on bythom.com. Oct 22 "NEX" is Gone, So What Do We Call It? Sony's marketing department seems a little behind all the new product action. 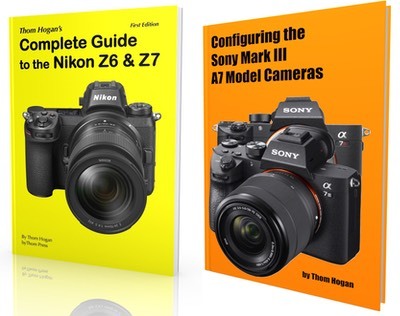 At the A7/A7r introduction, Sony said that they will longer be any NEX-branded cameras in the future. Read the full article on sansmirror.com. So yesterday's poll (still live) gives us a snapshot into serious Nikon user's minds, and there's no real surprises in the numbers. Read the full article on dslrbodies.com. It's another great day in Savute, with lots of action all over the savannah and marsh. Every vehicle went its own way this morning, with one heading out to try to find the illusive cheetah, me looking for more honey badgers. Read the full article on bythom.com. Oct 21 The Return of the FM? Everyone else is talking about it, so I guess I have to, too. ;~) Read the full article and take the poll on dslrbodies.com. The Savute channel didn't start running this year until late. Thus, the flooding that creates the marsh is relatively recent to our arrival. That has a number of impacts. Read the full article on bythom.com. The spec-lovers are going crazy. "24 or 36mp! Full frame! Sony is going to crush Olympus!" Read the full article on sansmirror.com. With seven cameras and six lenses announced in five days, coupled with other recent launches, we're now seeing some clarity about how the camera makers are attacking the declining market. Read the full article on dslrbodies.com. Fujifilm added phase detect autofocus to the X-E1, improving the video capabilities to include 1080P/60 and 720P/60…Read the full article on sansmirror.com. Sony's modest success with the RX100 has attracted all the other sharks swimming in the pool that keeps getting smaller. Today Fujifilm introduced it's answer, the XQ1. Read the full article on gearophile.com. While we can't quite call it a pocket mirrorless camera, the new Panasonic GM1 with the collapsing 12-32mm f/3.5-5.6 OIS kit lens sure seems to come close. Read the full article on sansmirror.com. Oct 17 Nikon Drops the D5300 On the Market. Thud. Earlier this week in anticipation of the D5300 announcement I wrote an article about single product introductions and their implications (or lack thereof) on a company's fate. Read the full article on dslrbodies.com. Along with the D5300, Nikon introduced the 58mm f/1.4G AF-S lens. Given the US$1700 price, one would have to expect this to be the best performing normal lens Nikon has produced. Read the full article on dslrbodies.com. I've been hearing from both current and prospective D800E owners about the new Sony A7r. Same 36mp sensor, same lack of AA filter. Gotta be a slam dunk for Sony, right, as their camera is less expensive, smaller, and lighter than the Nikon DSLR. Read the full article at dslrbodies.com. "Canon and Nikon were caught napping." "Game over." "Sony is going to crush Leica M, high-end APS, low-end FX, and maybe even high-end FX competitors." "m4/3 can't compete." Those are some of the comments rolling into my InBox today. I'm sure there will be more. Read the full article on sansmirror.com. Sony has added a third RX to the lineup: the US$1300 RX10. Read the full article on gearophile.com. The A7 is a 24mp full camera with on-sensor phase detection focus support and an AA filter. The A7r is the same camera but with a 36mp full frame sensor that doesn't have on-sensor focus support nor an AA filter. Read the full article on sansmirror.com. Also A7, A7r, 24-70mm, 35mm, and 55mm data pages. The Sony QX10 is Sony's attempt to make a smartphone accessory that gives you a better camera option than the built-in one. Read the full review on gearophile.com. Nikon today announced in a press release that they are suing Sakar. Read the full article on sansmirror.com. I don't usually publish rumors, but I've gotten wind of what the various camera makers are going to dress up as at the Halloween party this year at PhotoPlus, and I thought I'd share the information with you. Read the full article at dslrbodies.com. Today's another of those "moving" days. This time we take a short walk behind the Camp O lodge to the airstrip, where we have three small planes waiting for us to take us to Savute. Read the full article on bythom.com. It seems from a number of emails I've received that a number of people didn't see or didn't understand my point about buying a D600 is like placing a bet. So let me explain. Read the full article on dslrbodies.com. For the last year I've been seeing a lot of variations of the headline: "I think that the E-M5 will save Olympus" or "The next Alpha is going to save Sony" and so on and so on. Read the full article on dslrbodies.com. "Note that it's not always necessary to position things precisely on hot spots or third lines." This comes in a section that starts with "[The Rule of Thirds] is the most fundamental of the rules of composition" Read the full article on dslrbodies.com. Yesterday I ended by challenging folk with an antelope identification. There are about 70 species of antelope in Africa which have full-grown sizes from about 16 pounds to a half ton. Read the full article on bythom.com. I didn't say much about Camp O in yesterday's entry, so I need to make up for that today. It's a very pleasant oasis in the middle of the delta that has a motto. Read the full article on bythom.com. Oct 9 What Should D600 Owners Do? Now that the D610 appears to be Nikon's solution to the D600 debris/splatter problem, that leaves a lot of D600 owners asking what they should do about their cameras. Indeed, that's been a common email I've gotten for awhile now. Read the full article on dslrbodies.com. If anyone at Nikon were to do a Google search today to see how the D610 rollout is going, this is what they'd find…read the full article on dslrbodies.com. Nikon today announced a new camera, the D610, which should be on dealer's shelves by the end of the month. The question is "why"? Read the full article on dslrbodies.com Database page for the new D610 here. Oct 7 "They're Not Going to Be Around in Five Years"
Oct 7 Samsung Announces Korea-only NX300m article and data page on sansmirror.com. It's our last day at Camp 9, so maybe it's a good time to talk about the camp. Our camp faces out onto a small pond, and conveniently faces the sunrise (and moonrise). Read the entire article and see the photos on bythom.com. Zeiss today announced the 55mm f/1.4 Otus lens, a close-tolerance and no-compromise image quality optic for Nikon DSLRs (a Canon version was also introduced). Read the entire article on dslrbodies.com and see the database page for the lens there, as well. Every year I do a spring cleaning. This year I've started only six months late (I'm usually later ;~). The second set of items is now on the Welcome to ThomBay page. There will be more. I've just scratched the surface, so check back each week for more. You always remember your first lion in the wild. Here are just three of the shots from students of the male that was our first lion sighting on this trip…Read entire article and see the photos on bythom.com. Oct 4 My teaching assistant Tony's items added to ThomBay sale.